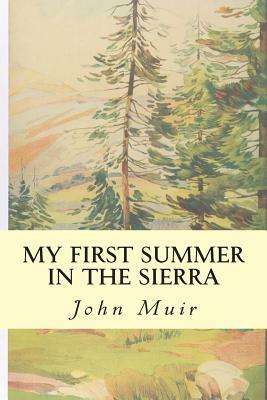 My First Summer in the Sierra is a classic nature/outdoor adventure classic by the great American naturalist, John Muir and a fine example of John Muir nature writings. In My First Summer in the Sierra, John Muir states that in the great Central Valley of California there are only two seasons--spring and summer. The spring begins with the first rainstorm, which usually falls in November. In a few months the wonderful flowery vegetation is in full bloom, and by the end of May it is dead and dry and crisp, as if every plant had been roasted in an oven. John Muir (April 21, 1838 - December 24, 1914) also known as "John of the Mountains" and "Father of the National Parks," was an influential Scottish-American:42 naturalist, author, environmental philosopher, glaciologist and early advocate for the preservation of wilderness in the United States. His letters, essays, and books describing his adventures in nature, especially in the Sierra Nevada, have been read by millions. His activism has helped to preserve the Yosemite Valley, Sequoia National Park and many other wilderness areas. The Sierra Club, which he co-founded, is a prominent American conservation organization. The 211-mile (340 km) John Muir Trail, a hiking trail in the Sierra Nevada, was named in his honor. Other such places include Muir Woods National Monument, Muir Beach, John Muir College, Mount Muir, Camp Muir, Muir Grove, and Muir Glacier. In Scotland, the John Muir Way, a 130-mile-long route, was named in honor of him. In his later life, Muir devoted most of his time to the preservation of the Western forests. As part of the campaign to make Yosemite a national park, Muir published two landmark articles on wilderness preservation in The Century Magazine, "The Treasures of the Yosemite" and "Features of the Proposed Yosemite National Park"; this helped support the push for U.S. Congress to pass a bill in 1890 establishing Yosemite National Park. 7] The spiritual quality and enthusiasm toward nature expressed in his writings has inspired readers, including presidents and congressmen, to take action to help preserve large nature areas. John Muir has been considered "an inspiration to both Scots and Americans." Muir's biographer, Steven J. Holmes, believes that Muir has become "one of the patron saints of twentieth-century American environmental activity," both political and recreational. As a result, his writings are commonly discussed in books and journals, and he is often quoted by nature photographers such as Ansel Adams. "Muir has profoundly shaped the very categories through which Americans understand and envision their relationships with the natural world," writes Holmes. Muir was noted for being an ecological thinker, political spokesman, and religious prophet, whose writings became a personal guide into nature for countless individuals, making his name "almost ubiquitous" in the modern environmental consciousness. According to author William Anderson, Muir exemplified "the archetype of our oneness with the earth. John Muir (April 21, 1838 - December 24, 1914) also known as "John of the Mountains" and "Father of the National Parks," was an influential Scottish-American:42 naturalist, author, environmental philosopher, glaciologist and early advocate for the preservation of wilderness in the United States. His letters, essays, and books describing his adventures in nature, especially in the Sierra Nevada, have been read by millions. His activism has helped to preserve the Yosemite Valley, Sequoia National Park and many other wilderness areas. The Sierra Club, which he co-founded, is a prominent American conservation organization. The 211-mile (340 km) John Muir Trail, a hiking trail in the Sierra Nevada, was named in his honor. Other such places include Muir Woods National Monument, Muir Beach, John Muir College, Mount Muir, Camp Muir, Muir Grove, and Muir Glacier. In Scotland, the John Muir Way, a 130-mile-long route, was named in honor of him. In his later life, Muir devoted most of his time to the preservation of the Western forests. As part of the campaign to make Yosemite a national park, Muir published two landmark articles on wilderness preservation in The Century Magazine, "The Treasures of the Yosemite" and "Features of the Proposed Yosemite National Park"; this helped support the push for U.S. Congress to pass a bill in 1890 establishing Yosemite National Park. The spiritual quality and enthusiasm toward nature expressed in his writings has inspired readers, including presidents and congressmen, to take action to help preserve large nature areas. John Muir has been considered "an inspiration to both Scots and Americans." Muir's biographer, Steven J. Holmes, believes that Muir has become "one of the patron saints of twentieth-century American environmental activity," both political and recreational. As a result, his writings are commonly discussed in books and journals, and he is often quoted by nature photographers such as Ansel Adams. "Muir has profoundly shaped the very categories through which Americans understand and envision their relationships with the natural world," writes Holmes. Muir was noted for being an ecological thinker, political spokesman, and religious prophet, whose writings became a personal guide into nature for countless individuals, making his name "almost ubiquitous" in the modern environmental consciousness. According to author William Anderson, Muir exemplified "the archetype of our oneness with the earth."